Ilayathalapathy Vijay’s much anticipated film of the season Thalaivaa released in record number of screens on the eve of Eid. 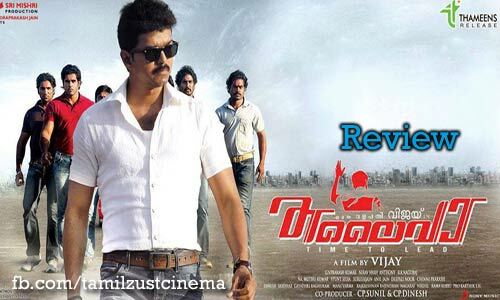 Check out Thalaivaa Movie review in a while…. the year 2013. The film is touted to be a message oriented action entertainer. Amala Paul is romancing Vijay for the first time in this film. Vijay will be seen as a dance master in the first half where he reveals his flash back which picks up loads of intensity. Ragini Nandwani and Abhimanyu Singh are playing prominent roles in the film. GV Prakash Kumar rendered tunes for Vijay’s Thalaivaa. Nirav Shah is director of photography while editing by Anthony. AL Vijay is the director of the film and Chandra Prakash Jain is the producer of Thalaivaa. Stick on Zustcinema for Vijay Thalaivaa review ….